The Electro-Hydraulics Learning System (85-EH) teaches electrical relay control of industrial hydraulic applications. Learners will study industry-relevant electro-hydraulic skills including operation, installation, performance analysis, and design. The electro-hydraulic training system can be used with Basic Hydraulics (85-BH) or any Amatrol learning system that includes the Basic Hydraulics training system. Electro-Hydraulics can also optionally be used with Intermediate Hydraulics (85-IH). 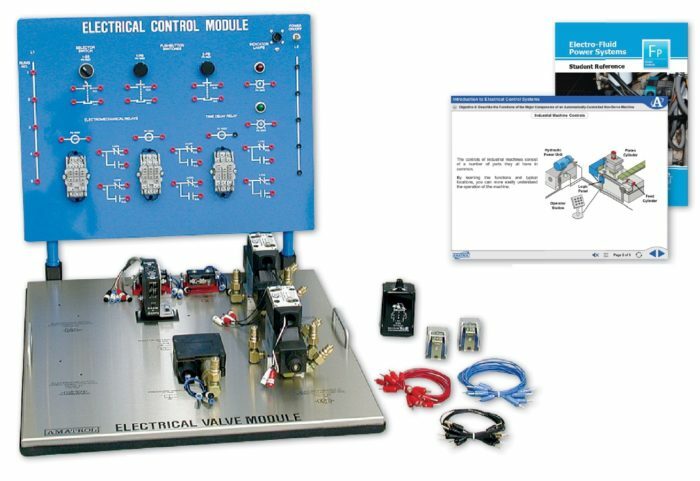 The Electro-Hydraulics training system includes an electrical control panel with relay control components and an electrical valve module with solenoid-operated hydraulic directional control valves and electrical / electronic sensors. These components will be used to study a variety of topics including electrical control systems, basic control devices, power devices, control relays, sequencing control, timer control, pressure control applications, and circuit applications. This learning system includes two panels, an electrical control panel and an electrical valve module. The electrical control panel includes two pushbutton switches, indicator lights, two control relays, and a timer relay. The electrical valve module includes directional control valves, a pressure switch assembly, limit switch assemblies, and a photoelectric switch assembly. Learners will use these components to set up a variety of industrial relay control circuits using ladder diagrams and Boolean logic. Relay control is a fundamental building block in the study of automation since programmable controllers and solid-state controls also use the same programming methods. Learners using electro-hydraulics will gain in-depth knowledge of electrically-controlled hydraulic systems used for industrial applications. This system’s curriculum covers a large selection of electro-hydraulic topics including logic elements, ladder diagrams, solenoid-operated valves, circuit protection, transformers, relay operation and applications, cylinder sequencing, timer applications, and pressure switch operation and applications. This system includes interactive multimedia curriculum that features stunning 3D graphics, audio voiceovers, and interactive quizzes and activities. Electro-hydraulics is a flexible training system that can be used with a wide-range of products featuring Amatrol’s Basic Hydraulics (85-BH). Options for utilizing the 85-EH include: Controls Technology – Basic Hydraulics (850-H1), Basic Fluid Power (850-C1) for both hydraulic and pneumatic training, or one of our double-sided trainers for maximized use of space. This line of products features Controls Technology – Basic Hydraulic (850-HD1) and two combination systems: Basic Fluid Power with two hydraulic manifolds (850-CD1) or one (850-CD2). The electro-hydraulics training system can also be used to with Amatrol’s Intermediate Hydraulics (85-IH), which can also be added to the previously listed products. A sample copy of the Electro-Hydraulics Student Reference Guide is also included with the system for your evaluation. Sourced from the system’s curriculum, the Student Reference Guide takes the entire electro-hydraulics training course’s technical content contained in the learning objectives and combines them into one perfectly-bound book. Student Reference Guides supplement this course by providing a condensed, inexpensive reference tool that learners will find invaluable once they finish their training making it the perfect course takeaway.